The PIRELLI CINTURATO ™ CN12 came out in 1971 and was fitted to the Lamborghini Muira SV. Juan Manuel Fangio and CINTURATO ™ PIRELLI. The PIRELLI CINTURATO ™, introduced in the 1950s, was the first radial tyre of the textile rope type. 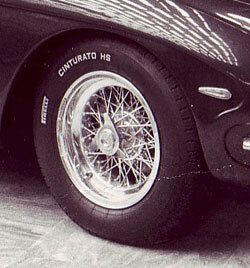 The PIRELLI CINTURATO ™ quickly became the radial tyre dominating European GT and sports car races. The PIRELLI CINTURATO ™ combines excellent adhesion with high-speed capability, and the CINTURATO ™ is also a very comfortable tyre. Unsurprisingly the PIRELLI CINTURATO ™ quickly became the original tyre on many Italian brands, such as Ferrari, Maserati, and Lamborghini.